So we did this radio interview several months back… and I didn’t know how to present it online in a fashion that would entertain and inform. Here is what we came up with… enjoy the interview and about 200 photos from over 50 school readings and author appearances. Don’t forget that you can purchase Pete the Popcorn online at this link. 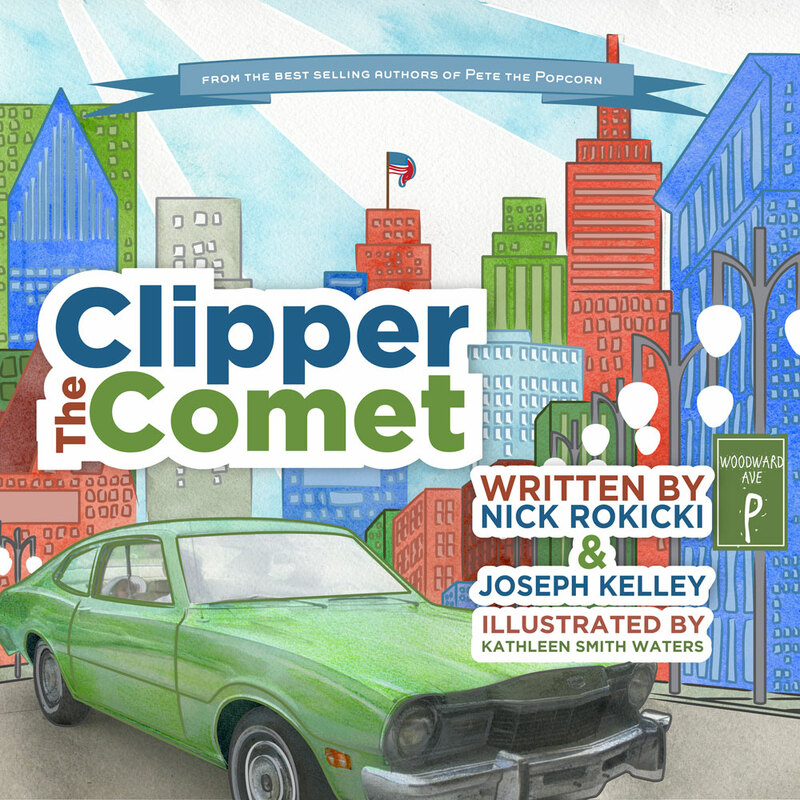 And you can find our newest release, Clipper the Comet by clicking here. To all of our Pete the Popcorn fans… if you haven’t seen a full presentation yet– this is what we do! Here it is… the moment I’ve been waiting for… and hopefully you have, too! Of course you want to know all of the details! Well, Clipper is a Classic Car… parked in the garage of little Nick and Riley’s grandparents! The kids always want to take the car for a ride… but the grandparents don’t drive it! After all, this is a CLASSIC CAR. The story pays tribute to old-time Americana, family, the American auto industry, and small towns like Lorain, Ohio and Blissfield, Michigan. Parts of the story and the cover pay homage to Detroit, Michigan– the Motor City. Most importantly, this book explores the special relationship between grandparents and their grandchildren. This book was a last-minute project that was definitely a surprise to us, too. Joe and I went to look at a newer car one day— and saw this 1975 Mercury Comet parked in the front yard. Immediately, I was hooked. We drove the car away in mid-April and the book is released in mid-June. Talk about a fast release. I’m not a car person. But I was so interested in the history of this vehicle and the stories that come with it. Who bought it? What was the gas price in 1975? Where did this car drive to? Who rode in it? This car must not have too many stories— it only has 11,000 original miles. So, what’s your story? What was America like in 1975? Tell us about your grandparents. I want to know about your first car. Do you have a classic car? Tell us about it. This book is meant to start a conversation. Pick up your copy today… and tell us a story. After all, if we tell you a good story, we deserve one in return, right? Look for Clipper the Comet in stores…. and on the roads.